The classic for every wardrobe - a ladies blouse in a figure-hugging cut with princess seams and a beautiful, narrow lapel collar. 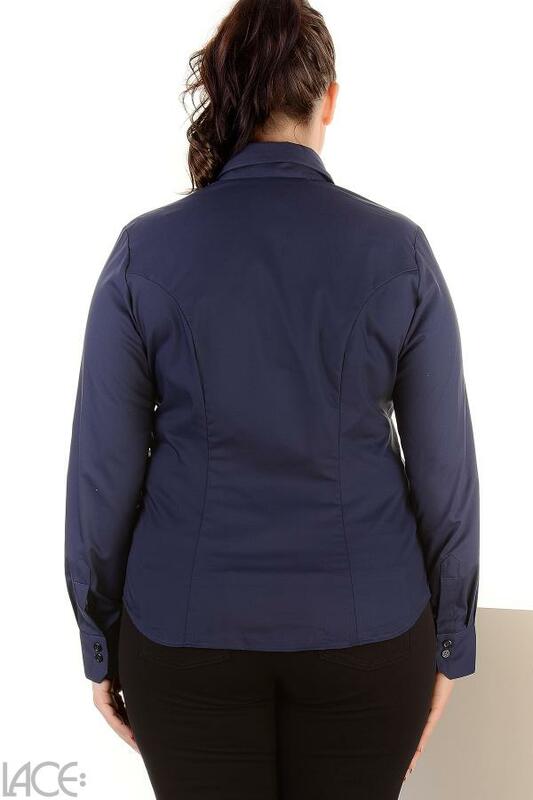 This style in a classic dark blue features slimming design lines. The feminine collar and the simple cuff look clean and polished. This blouse can be worn for dressing up and professional looks, or even paired casually with jeans. The hem is slightly curved, and the seams have a clean finish. Fit and cut to size, in a classic shape with two dividing seams in the front and back part, and through the addition of extra fabric in the bust, this blouse always sits perfectly - even in larger cup sizes. Note: Victoria is a figure-hugging cut and therefore falls rather small. If you are at the top end of the size range, between two sizes, or prefer a looser fit, add about 2 cm to your measurements and order the calculated size. For this blouse a mix of cotton, elastane and polyamide is used, finely spun into a wonderfully light blouse fabric - fine, with a smooth handle. Not only does it feel incredibly smooth and pleasant, but it also requires virtually no ironing. Fit, support and function. They are key to lingerie that suits you perfectly and makes you feel great ... Maximila Victoria classic shirt belongs to the category Blouse and is part of the collection Classic Shirt. The product has the article number 3010CDB_darkblue=01b by Maximila, and is available in the following colours: DARK BLUE, and is made from these materials Cotton 100%. We despatch your order within 3 working days, so you can expect delivery within 5 working days. We accept payments from credit cards and Paypal.